National Coffee Day with Dunkin Donuts (+ Light & Fluffy Pumpkin Dip) | The Food Hussy! This post is sponsored by Dunkin Donuts but all opinions are my own. Thursday is National Coffee Day and we always know how to celebrate that great day - with Dunkin Donuts! It's also their 66th Anniversary so they're offering 66 cent medium hot coffees all day tomorrow! But I decided to do more than just drink the coffee - I'm gonna cook a little with it. 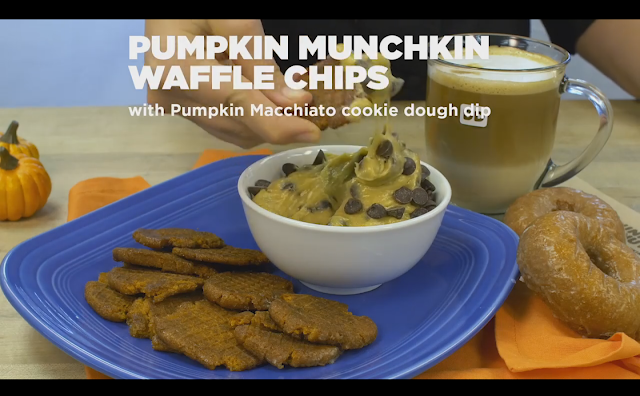 I was inspired by this recipe video on Facebook for Pumpkin Munchkin Waffle Chips with a cookie dough dip. I decided to make mine a little easier - of course! This one is super simple with just four ingredients and it's so good! Mascarpone cheese (find at grocery store - kind of the texture of cream cheese), Cool Whip, Pure Pumpkin and mini chocolate chips. That's it! Throw the mascarpone, whipped topping and pumpkin in a bowl and grab the hand mixer - one minute and you're done! Then stir in your mini chocolate chips and that's it! This is a great quick dessert - especially when everybody is pumpkin crazy! You could eat it on it's own like a pudding or use it as a sweet dip for graham crackers, cookies or DONUTS! That's right - I'm going to use them on donuts on Local 12 this morning with my friends - Bob, Sheila and John! Beat the cheese, whipped topping and pumpkin together with a hand mixer for a minute. Fold in mini chips. Refrigerate and serve with donuts!